We have a four hour layover before we head out to LA. We found a sweet spot where we always hangout. There is a nice rest area with wifi and a small movie theater. They even give you tokens for a massage chair. Very relaxing before our 12 hour flight into California. Oh man we miss the sign! 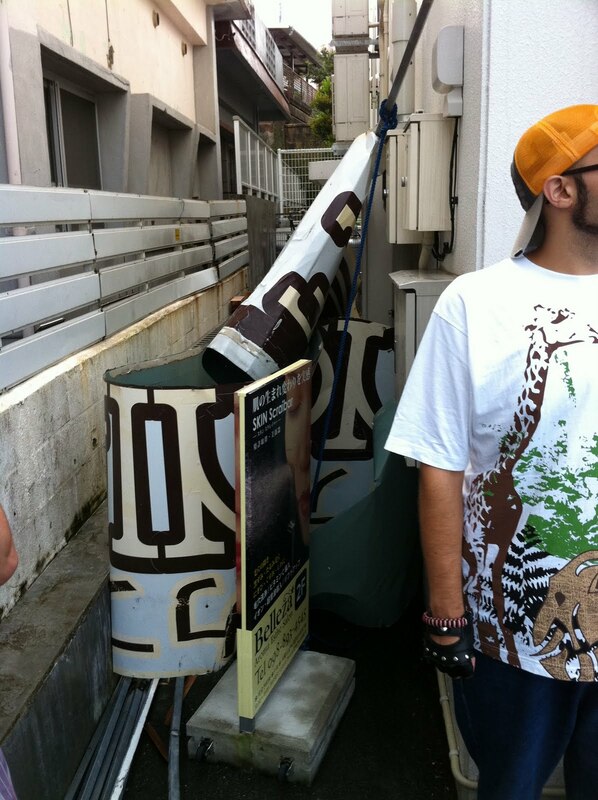 Typhoon Songda blew the sign right off the building. Praise the Lord no one was injured as it flew into the street and crumbled like a tin can. It just goes to show you that we must be careful driving in a typhoon. You never know what might blow into the street. Thank you Jesus, no one was hurt, but Lord Jesus , we do miss the sign. Any ideas people for something new? 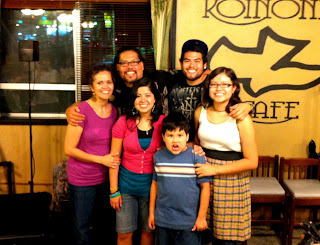 We had a graduation party for Hannah at the Koinonia Cafe and everyone had a blast! She wanted Taco Rice and others brought the side dishes. The desserts were excellent! God bless you Hannah, God has great things in store for you in California, be blessed in Jesus! Miracles, miracles, God does miracles. Zach's re-entry permit expired, but they allowed him to renew it on the spot. God is good. We are on our way! We are heading out to see family and do a lot of ministry. Please pray for us, I will be speaking at different churches and we will be traveling to New Mexico for the worship conference. We had a four-hour layover in Kansai Airport so we decided to take a shuttle to the premium outlets and grab some dinner. It was a lot of fun. Now, next stop; Okinawa! Daniel's wedding was a blessing and hanging out with Pastor Mike is always fun. The extra blessing was being with Jesse, George and Patti. Now, back to Okinawa to see our big family. Daniel and Nayeon are heading to Incheon Airport and the next day they are flying to the States, but I will let them tell you where they are going. Be safe Sedota's and have a wonderful time. They are finally hitched! As you can imagine Nayeon looked simply beautiful, and Daniel looked good too. Congratulations new Sedota couple, your wedding was beautiful! But the girls came too, we did not let them in the picture. This was Daniel's last night out as a single man so we "porked out" (literally) with some Korean BBQ. It was a real feast! Chowin down Korean style, so good. Happy Marriage Daniel! Really new town because they are doing a lot to old town. The place is beautiful with so much shopping. You can buy everything from Korean socks to fresh fish. Outdoor and indoor shopping, we had a good time. Some of the children's ministry moms made sandwiches for everyone to eat in appreciation for all that Hannah does for the kids. Thank you Hannah for all your unselfish service to the ministry. This is a good picture of the new play ground that is a part of CCFuchu. I wonder who built it? Check out the crew from Fuchu, it looks like they are having a good time. We are so blessed that Anna and Aya can be a part for the next few weeks. Stay strong girls, keep serving Jesus! Well, it did not survive the big typhoon that blew in yesterday. 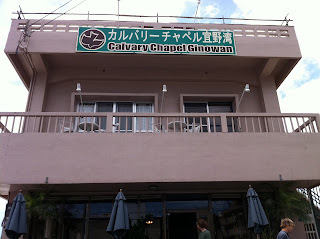 Our Koinonia Cafe Sign that Pastor Tim designed about 6 years ago was no match for Typhoon Songda. As in the words of Zach "it folded up like a tin can". Please join us in prayer that the Lord would provide a new sign and the new artwork for God's "Koinonia Cafe". They are here in Korea for their son's wedding. This is Daniel and Nayeon's new apartment. It looks great, and Daniel just loves it. The Sedota's look great! They have been getting ready for this wedding for some time. A great joy just to hang out with them. Our brother is serving here in Korea for the summer. It is so good to see our brother. Jesse is attending College in Kansas, Barclay Christian College. He is doing great, Jesus is still first in his life. Joanna and I are headed to Korea to celebrate Daniel's Wedding this Saturday. It will be a quick turn around, we will be back in Okinawa on Sunday night. 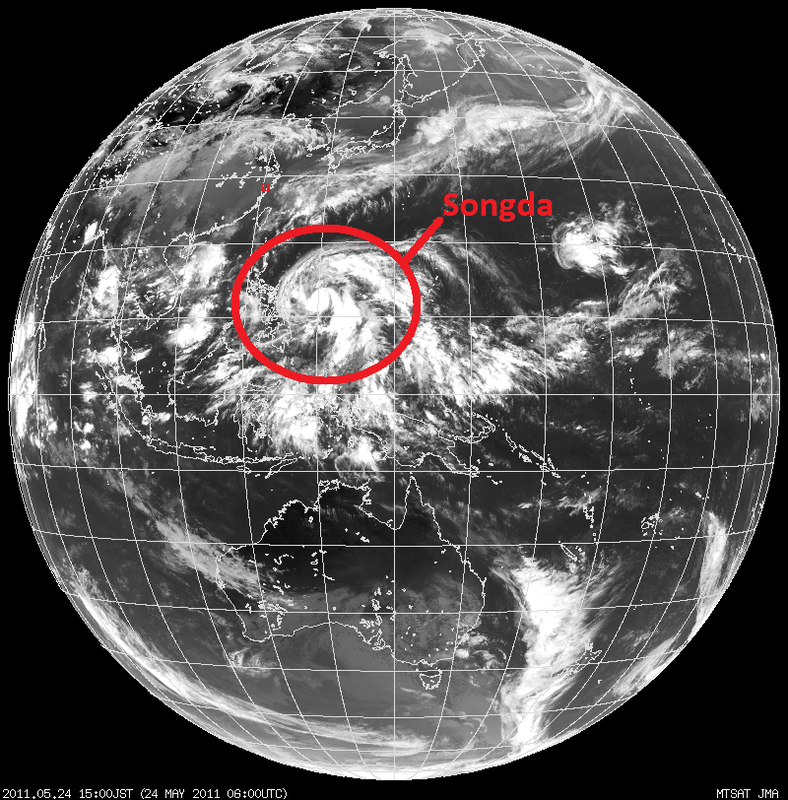 Pray for us that the Typhoon does not hamper our flight return. Pastor Cisco is up and doing well. Boy that guy has lost some pounds. He is back to his prize fighting weight. Manny the "pacman" better watch out! But in all seriousness, "thank you Jesus for Your healing touch". For Hannah's special graduation we took her out for a super special dinner. A high end Yakiniku Dinner in Naha City. We are talking "High End" and it was absolutely delicious! Congratulations Hannah, we are so proud of you. 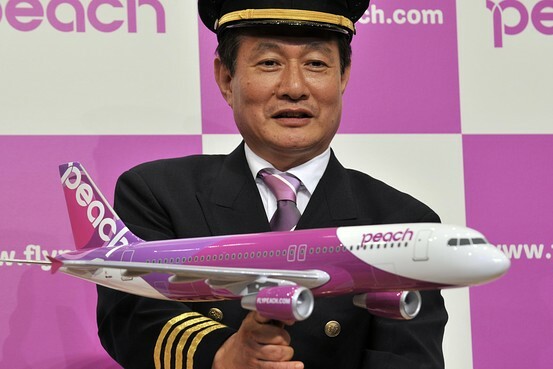 The long awaited budget airline from ANA, Peach Air. Believe me this is good, competition is good, we now have Skymark airlines which is pretty good on discount airfare throughout Japan, and now we have Peach Air. Let the airfare wars begin, another good thing about Peach, they will be flying to Korea. The flight options are getting better. The team had a good time at Natsuki's house. She invited the girls and guys D house over for dinner. They said that it was delicious. Thank you Natsuki for inviting the crew. Most of the students are now gone but we still had a good crowd for our Friday night prayer meeting. There were so many things to pray for. We know God heard all of our prayers and will answer them according to His will. Pastor Rich picked up the girls from Haneda and drove them to the church. They are finishing up their first weekend serving at CCFuchu. They also were treated to their first "world famous" Black Thunder Ice Cream Bar, it looked delicious. Aya and Anna have left for CCFuchu to serve alongside Pastor Rich. They will be there for close to a month. Afterwards Anna will be heading to Germany while Aya will either come back to Okinawa or go to Nagano. We are going to miss these gals. God bless you girls. Next time in Okinawa; Married! 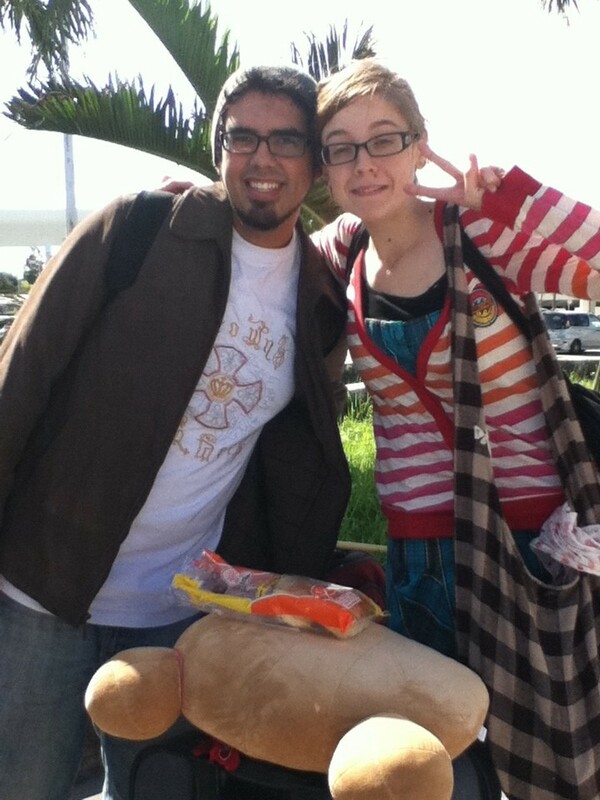 Eder and Amanda have left Okinawa and are on their way to America. Amanda will be meeting Eder's parents and then she will be flying out to Michigan. They will come back together in Nevada and then the 24th they will be getting married! This is really exciting! It all began at CCBC Okinawa. There have been some beautiful relationships that have begun on this island, and why not? It is a beautiful sub-tropical paradise, what better way to meet your future bride. God bless you Eder and Amanda, we love you both, very much! The long fight for Ally back to Michigan, and Cameron heads back to Alaska. I wonder how cold it is going to be for both of them. Thank you Cameron and Ally for being a part of this semester. God bless you both. Our two buddies are on their way out. We are going to miss these two warriors. I know that they are going to miss my morning song. God bless you bros, be safe and be blessed. These are the exact words that Amanda said. Kind of cute huh? There are only 5 weeks left until they will be joined in marriage. Both Amanda and Eder leave Okinawa this Wednesday to prepare for that special day. "Lord , bless this wonderful couple"! Awe man! Martin is leaving! We are going to miss you bro. But we are looking forward to seeing you again in Murrieta. Martin has a job on campus this summer. So you will always know where to find him. God bless you Martin, have a safe flight. Sunday is the anniversary of the day that the USA gave Okinawa back to Japan. That was over 60 years ago. It was a peaceful march, Okinawan's are a peace loving people. Sunday morning after first service Moses is heading back to Korea and Angie is heading to Nagoya to visit a friend for a few days and then back to California. God has good things in store for these students and Moses will be coming back to start his third semester in August. God bless you both. At the Father/Daughter Ball the girls had a great time. Here, Hannah is showing the younger girls how to find their groove. The Dad's had just as much fun. The next guys have now left. We are going to miss our brothers but we know God has good things in store for them. 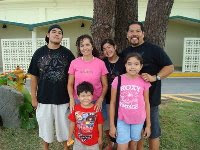 Po will be serving ministry at his church and Michael has a vision to serve in Guam. God bless you guys! The first students are the hardest; Jenny and Casey Fain plus Jonathan. We are going to miss them. The good news is that Jonathan will be back as one of our interns. God bless all three of you, we will miss you. 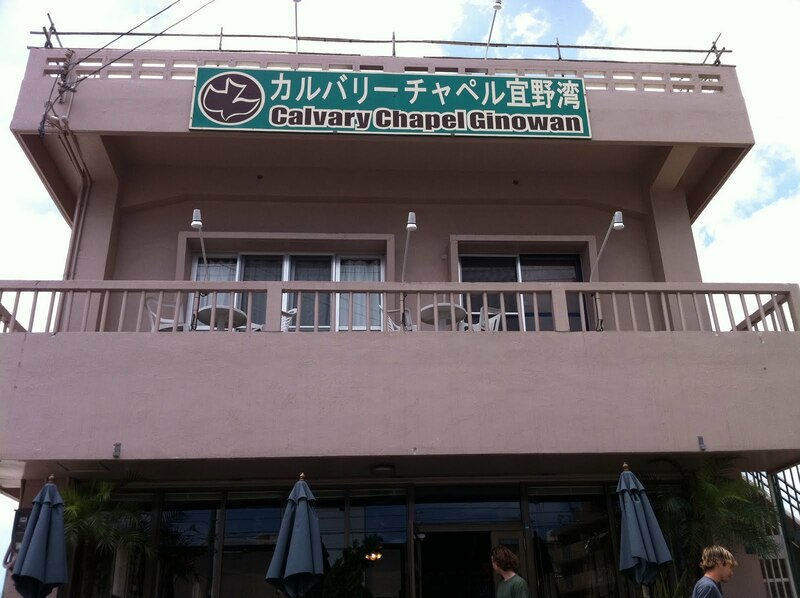 Pastor Rick from CCOkinawa graciously invited us to be a part of their special event. Both Hannah and Michal are also guest speaking. We are looking forward to a great night! A picture of the Worship Conference Pastors and their leaders. Just one more reminder of the fun during the conference. Thanks guys for being a part this year. Wednesday night we celebrated the students who graduated from the Bible College. We are excited that all three will be returning as interns. God has good things in store for this group. Josh will be staying with us Okinawa. Anna will be heading to CCFuchu for a month of service, and Jonathan will be graduating from Murrieta and coming back later in the summer. For Michal's Birthday we went out to lunch together. She chose to go to Micky D's. This was her first whole Big Mac, usually we eat off the dollar menu. Nothing like splurging on a set meal. The only thing that is left is the final exam. That will be administered as a take home. The students look happy to have completed another course. There is nothing to compare with the feeling of completing a Bible Course. Se people are too gifted; Amanda is one of them. She made this special Birthday Card for Michal. Check out the characters and see if you can make out Michal's siblings. Again, Happy Birthday Michal! We did something totally different this semester. 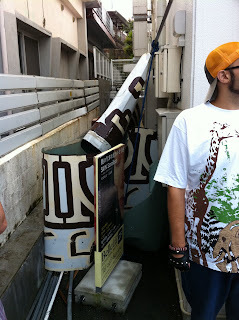 We headed out to Kokusai Dori and had the banquet at a "Yakiniku" restaurant. It was an "all you can eat" BBQ. It was delicious! We are going to miss these students. We love them very much. After w2 we celebrated Michal's Birthday. She did not want a cake but asked for "kakigori" instead. What is kakigori? It is what we call snow cones in the States or shaved ice in Hawaii. We had a blast! Happy Birthday Michal! Thank you men for coming and blessing the people of Okinawa! Words cannot express the joy and gladness of having you all here. Be blessed and know that your congregations are blessed with servants of the Lord like you. God bless you ALL! The night before the Pastors left for the mainland we had a get together at our house. The students brought snacks and Hannah baked some goodies. We are really going to miss these guys.